A few weeks back my wife was really under the weather. As a result, I was in charge of all meals. Rather than making runs to carry out places, I decided to increase my skills at cooking. I have done my share of cooking in the past. There are the traditional barbecues on our grill on the patio to be sure, but I’ve done more than just that. Because I was in Boy Scouts, and later was a Boy Scout leader, I did pick up other cooking skills as well. I can cook most anything I set my mind to at camp. Now, let me make this clear. My wife is a far superior cook to me, and I will never have her skill level. That said, I can hold my own. Now that she is back healthy, I am keeping on with sharing the cooking chores. 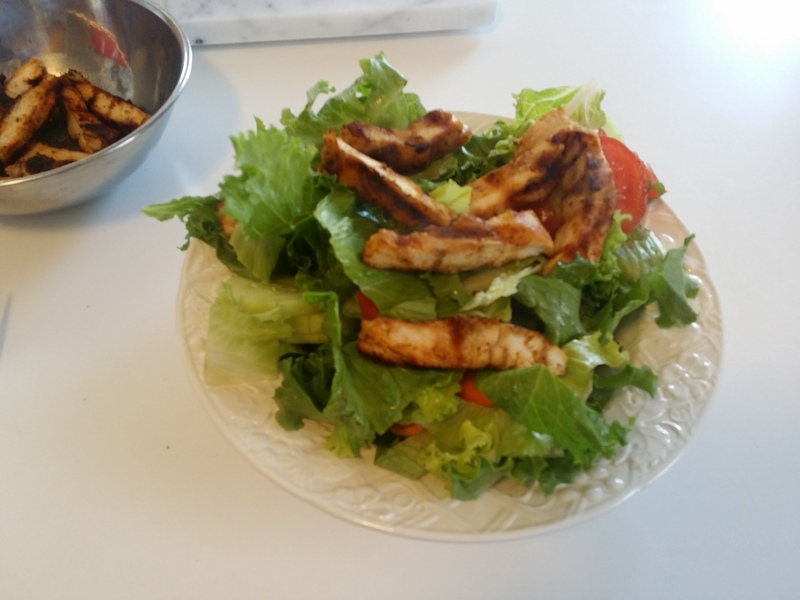 Last night we decided that a grilled chicken salad was in order. Over the weekend we’d put together a great salad of greens, cucumber, tomato, carrot and onion. All we needed to do was add a protein. Rather than just grill the chicken breast, I decided to try something a little more fun. We have been using the Louisiana Cajun Blackening spice on our fish for some time. (In fact, that is one of the dishes I recently added to my repertoire). 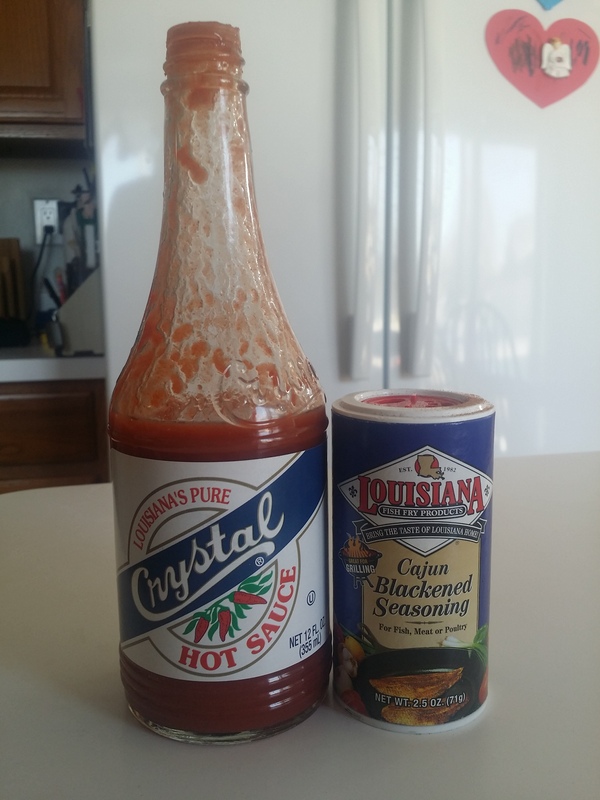 While we were on a trip to New Orleans, my wife picked up the bottle of Louisiana’s Pure Crystal Hot Sauce. I decided to find out what would happen if I combined the two. 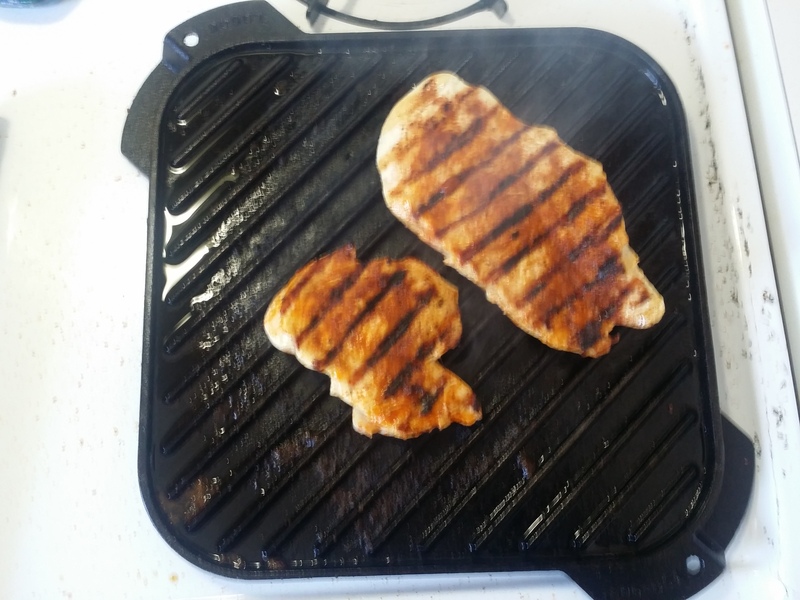 After another 6 minutes, I wasn’t sure that the breasts were completely done, so I sliced them and put them back on the grill for another minute just to make sure. 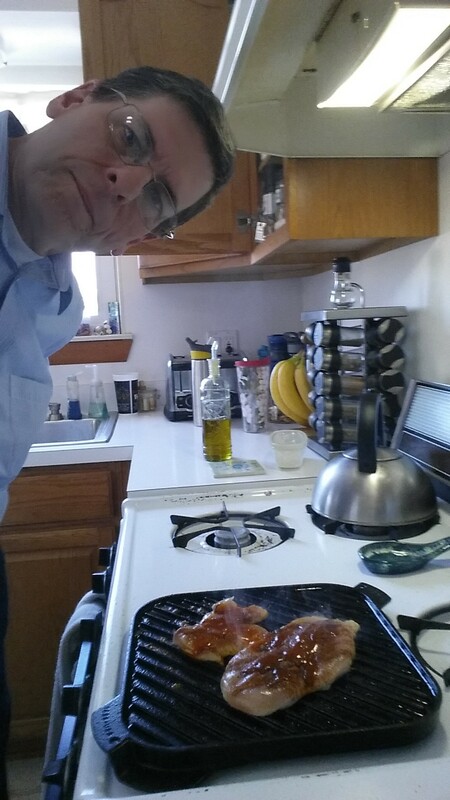 Here is me taking a selfie while cooking. As you can see, I have my game face on. Once it was all done, it was time to assemble the salad. My wife had the honors to go first. And here is how my salad looked as a finished product. This is a very low-point salad. All of the greens, tomato, cucumber and onions are zero point. 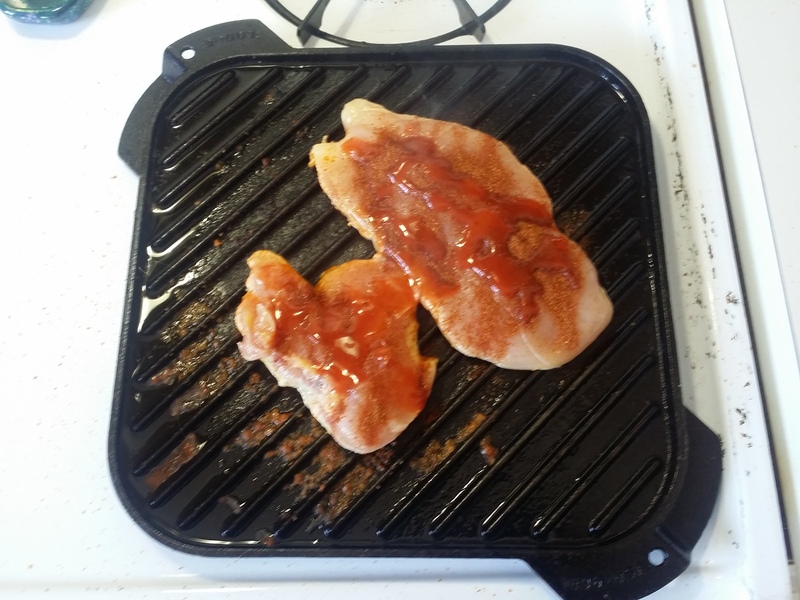 The seasoning and hot sauce add no points to the chicken, so it ends up being about a point per ounce. I put about 5 ounces on my salad. 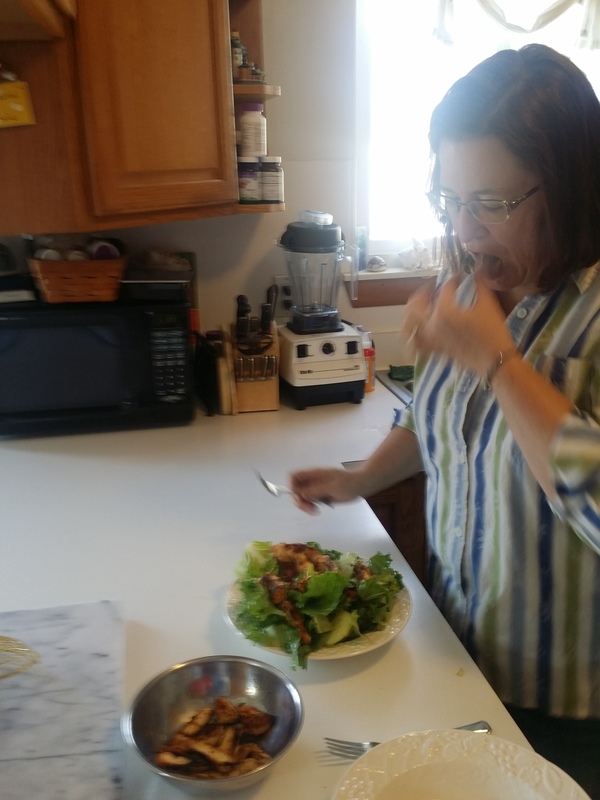 To finish it, I added Frank’s Red Hot Sauce instead of salad dressing, so the sum total of my salad was 6 points. I went back for seconds on the greens and such, and also coated that with Frank’s. So, I ended up with a 6 point, very filling, hearty meal. My wife said she loved the taste of the chicken, so it is a keeper as well. I am also not Rachael Ray, but I did accomplish that meal in less than 30 minutes. ← How about a quick, 28 day boost?